Holy cow, talking about pocket computer! Why would they not have a rotating screen on this? Slow SSD or way too expensive,the white keyboard is ugly as hell too.And why would I want this instead of a Slider-MID with the same specs ? Dont tell me because of the keyboard. The larger keyboard is cool(ugly in white though). But when your on the move, the slider form factor seems to work better(at least from my experience with PDA phones). @JKK How's the Aigo on the go? 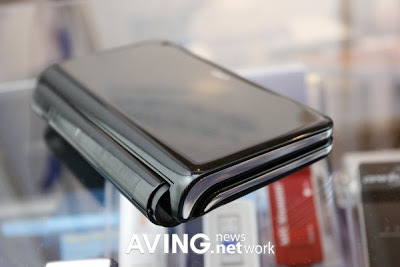 Does the Aigo work better than say the Fuji U820 of the Everun Note? Can anyone say Psion Series 5? Also, on this particular design the bezel is huge. They could have put more screen real estate on there. Finally the perfect one if battery does 3 hours. The U820 is almost perfect except not pocketable. I'm glad that U820 was delayed yesterday otherwise I would have bought it and missed this one. This is what the Fujitsu u810 should have looked like. So much clearner. The white keyboard need to go though. Aargh! Hands. Like. Hams. Too. Big. For. Netbooks/ HTC/ XPERIA/ Blah. Smite me or lest I be Smoten! This will cost many gromets, business user only I think. That keyboard looks a nightmare... and where is the mouse pointer? Other than that it looks good, though for some reason I get the feel of vapourwear here. This thing reminds me of the Sharp Zaurus. s xp running with att 3g hsdpa usb drive and ms office installed which makes this the perfect device. I´d like to try one. Two cell battery perhaps? Expecting a two hour battery life - a bit more if the engineering is great. 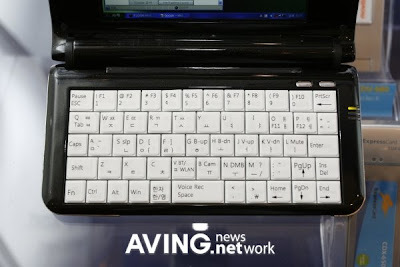 Funky keyboard, but it could work well after a while... though it's the battery life that probably makes or breaks this. Fujitsu u2010 can get easy 3 hours with 2 cells on 1.6ghz atom and bigger 5.6 inch screen.. I'm desperately waiting for a clamshell MID similar to the Sharp Zaurus, which has the best thumb-typing keyboard on it I've ever used. This, I think, is still going to be too wide. Here's to hoping, though. Based on geometry and my calculations from the screen size, this device has dimensions 160mm x 89mm, which is perfect for me.I'll buy it as soon as possible. No VGA port, no purchase! the large bezel is for the batteries, how the hell do you want 3+ hrs if you dont put batteries in the bezel. 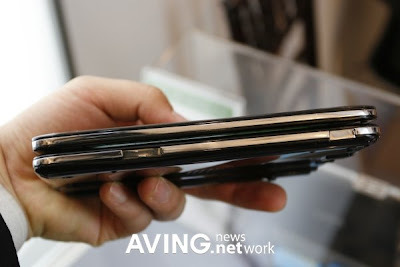 Look at the asus 901 6hrs and no protuding battery, hence hidden in bezel. I don't like the keyboard, screen should be wider and there is no touchpad. All the rest is fine. That's how you know a laptop charger is good. this thing looks great. I cant wait to see the pricing on this. Updated info on this device..
Looks more like an electronic dictionary. 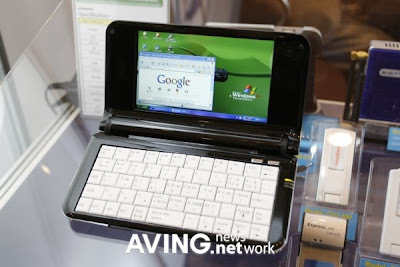 One of the sexiest entrants into what seems to be a burgeoning sub-netbook category. So will you be replacing your current 2kg laptop with the UMID? Im really very useful to follow a longtime see this as a blog here.Thank you for your valuable information.